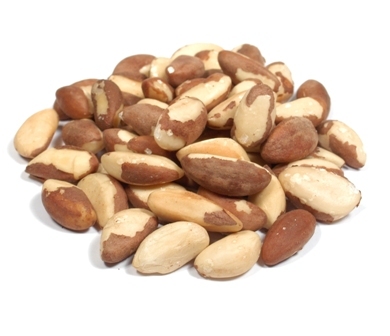 Brazil nuts contain exceptionally high levels of selenium. Adequate selenium foods in the diet help prevent coronary artery disease, liver cirrhosis and cancers. The nuts are expecially high in mono-unsaturated fats which help lower LDL or "bad cholesterol" and increase HDL or "good cholesterol" in the blood. These nuts are also a very good source of Vitamin E (a powerful lipid soluble antioxidant required to maintian integrity of cell membrane), Thiamin, Copper, Magnesium, and Mananese(anti-oxident enzyme).